Just 24 hours after launch, the newest revision of Apple's desktop operating system is responsible for 5.5 percent of all North American web traffic originating from Macs, a new study says. 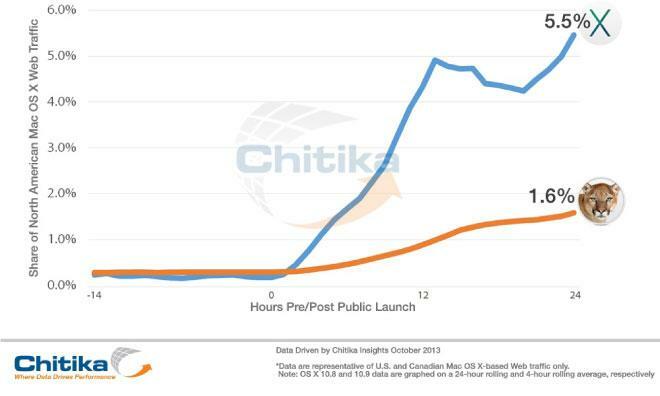 Online advertising network Chitika, who also tracked adoption of OS X Mountain Lion after its release last year, said that Mavericks adoption "significantly outpaces" that of its feline sibling at the same point. Mountain Lion, released last summer, took four days to reach the 5.5 percent threshold, according to the company's measurements. Chitika speculates that Apple's decision to make Mavericks a free upgrade for Mac owners —as opposed to Mountain Lion's $19.99 price tag —is the primary driver behind its quick uptake. "With these results in mind, it's evident that at least on the OS front, Apple's free desktop software strategy is paying dividends from an adoption standpoint," the company wrote in a blog post Thursday. Another factor working in Mavericks's favor is its prominent placement as an available update in the Mac App Store, complete with a badge on the store's dock icon and a notification in Notification Center. Previous versions of OS X delivered through the store were not shown as updates; users were required to specifically navigate to and purchase the upgrades. Mavericks, available to 2007 or newer Macs running Snow Leopard, Lion, or Mountain Lion, is a significant update to Apple's desktop operating system. The update brings deep architectural enhancements that wring even more battery life out of Apple's laptops, enhanced support for multiple displays, an updated to the Safari web browser, new iCloud Keychain functionality, a new tabbed mode for Finder, and desktop versions of iOS's Maps and iBooks. The adoption numbers are generated by sampling "millions" of advertising impressions from the United States and Canada through Chitika's advertising network.